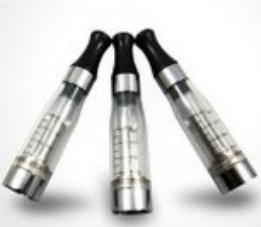 This is a very popular tank system for use with "eGo style" personal vaporizors. Very easy to use, fill and vape all day. It also makes it easy to change flavors by swapping tanks. 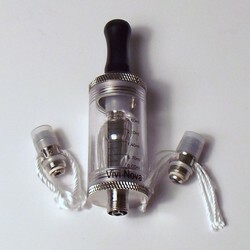 When the heating coil in your Clearomizer dies you can now replace only the head and re-use the tank and mouthpiece. This is a quick run down on how to use the Vivi Nova Tank (and the "mini" Vivi Nova). The larger capacity and ease of use makes this a nice choice for a beginner. Dripping is a simple way to enjoy vaping, it's done by dripping e-liquid directly onto the atomizer. This method tends to produce better flavor and allows you to switch flavors easily. When changing flavors it's best not to shift too far. for example it would be better to go from a coffee flavor to a chocolate or tobacco rather than trying to go from a coffee to a lighter fruit flavor. *note: Some flavors will tend to linger in atomizers, while others will vape out over time. When vapor production or flavor drops off and / or you get a "dry hit" just add 3 more drops of e-liquid. Cartomizers contain the heating coil and filler material that is saturated with e-liquid, you won't need to "top off" as often as you do with direct dripping. The main thing to remember is whether filling from the top or using the bottom fill method shown in this video - make sure the filler material is FULLY saturated before using!!! In the video Phil uses Boge brand cartomizers, but it will work with most other brands. Another style of tank system for the "eGo" It holds about half as much e-liquid as the "Clearomizer" tanks and they use a proprietary atomizer / cone.